Before I get back to The Rose of Versailles, I want to make a quick note that the manga The Window of Orpheus (1975-1981), which also features a girl being raised as a boy for the sake of being an heir, but is very different than Oscar. Julius von Ahrensmeyer is the daughter of her father’s mistress, who later becomes his second wife. Because von Ahrensmeyer’s first wife had two daughters, when Julius was very small, her mother began dressing her in boy’s clothes and passing her off as a boy; when she married von Ahrensmeyer, Julius became his heir. Julius has to keep up the disguise as long as her father lives so she can inherit. Unlike Oscar, who enjoys her work and her unusual life for the most part, Julius does not. She wants to wear dresses and be allowed to express her romantic interest in her crush Klaus, which she can’t do partially because of her all-boys music school’s strict “no homo” policy and social norms, as well as a desire to be true to herself. Additionally, she has to deal with the doctor who delivered her blackmailing her mother and threatening to out her. It’s a different take on the women-performing-masculinities genre in that, instead of being freeing or transgressive, Julius is unhappy in her role, a predecessor in some ways of the manga that would explore trans identities and social dysmorphia. While many manga in our discussion had anime versions released, The Rose of Versailles stands out from the crowd with 40 years of continual media adaptations and marketing. In the years after the manga wrapped, The Rose of Versailles became a cultural force unto itself. First, let’s take a brief look at how The Rose of Versailles has become as recognizable and referenced in Japanese culture and media as Star Wars before we delve into the other media the series inspired. Although she was born in 1947, Riyoko Ikeda is included in the Year 24 group along with Moto Hagio and Keiko Takemiya, whom we will discuss later. Best known as a manga artist, Ikeda also worked as a scenarist; in 2001, she enrolled in and later graduated from music school, where she studied opera. Ikeda’s works include Berusaiyu no Bara (The Rose of Versailles, or BeruBara), Oniisama e (To My Elder Brother), and Orufeusu no Mado (The Window of Orpheus). Many of her manga are historical fiction that examine topics in gender and sexuality; some feature queer or gender- nonconforming characters. 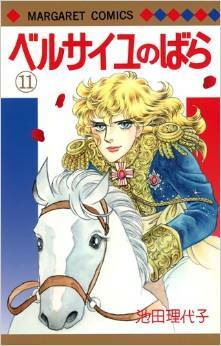 While she does focus somewhat on coming-of-age romances, which are topics typically featured in shojo manga, Ikeda wrote about adult relationships, particularly in The Rose of Versailles, as well as gender identity, political upheaval, and class issues. 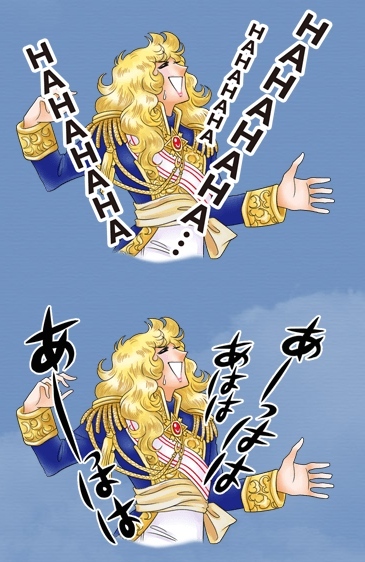 LINE has some new stickers from The Rose of Versailles (BeruBara)! Is the lovely Oscar-sama now spewing Internet slang? I finally got around to reading the new volume of The Rose of Versailles (ベルサイユのバラ), which focuses on some side stories about the male characters: Andre Grandier, Florian Girodelle, Count Hans Axel Fersen, and Alain de Soisson. I have mixed feelings about the volume. Parts of it were brilliant, but some of it felt a little forced. Mild spoilers for the volume, major spoilers for the original series. We could do with a bit of humor around the holidays, yes? 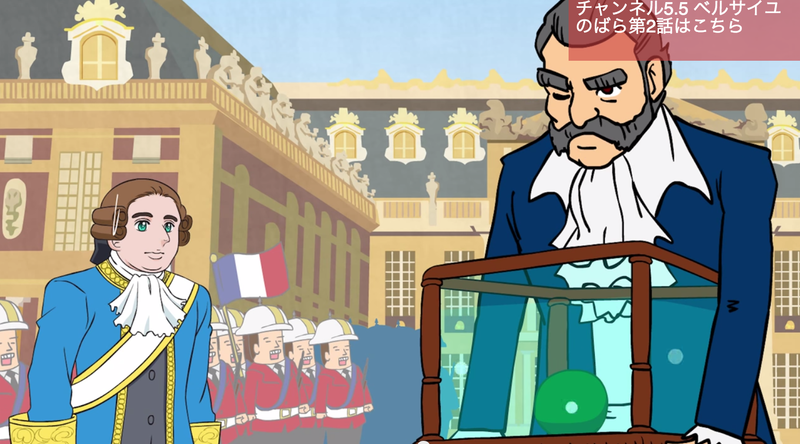 If you like fandom crack, Calorie Mate and FROGMAN collaborated on a Beru Bara parody anime, 「ベルサイユのマリモ」(“The Marimo of Versailles”). BeruBara LINE Stamps Go Global! Although LINE Japan has had a set of BeruBara stickers (スタンプ [“stamp”] in Japanese) for a year now, LINE has released a global set with brand new stamps. 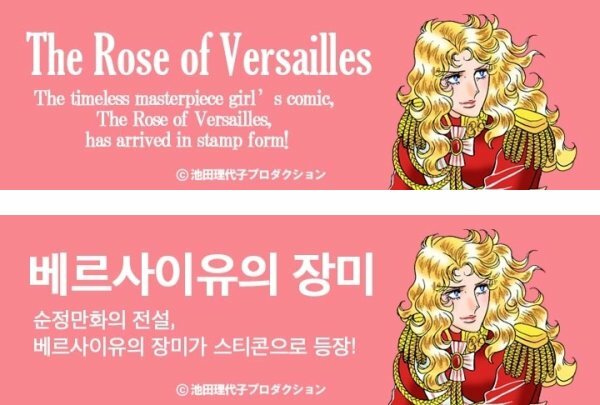 The stamps are $1.99 in the US store and are listed as “La Rose de Versailles.” The global set includes a lot more stickers than the original Japanese set. However, the Japanese set has a few that aren’t in the global set, including the 挟撃！one of Oscar riding into battle, which I use a lot. According to the press release, there will be other stamps for the app “Kakao Talk” (カカオトーク). There’s a lot less text than in the Japanese version. I think my new favorite is Oscar holding up the “NO” scroll.